Smithsonite is a carbonate mineral of zinc. It has the composition ZnCO3. 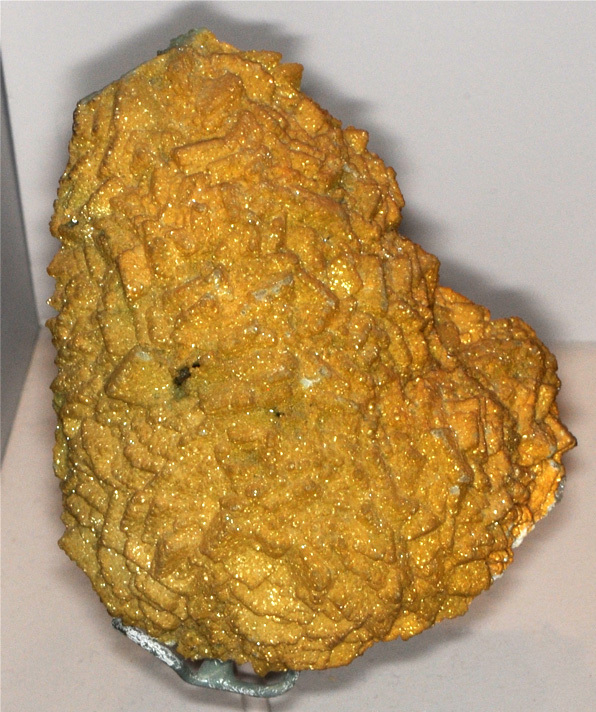 The origin of this sample is Broken Hill, New South Wales, Australia. It is on display in the Smithsonian Museum of Natural History. The sample measures about 8 cm across. 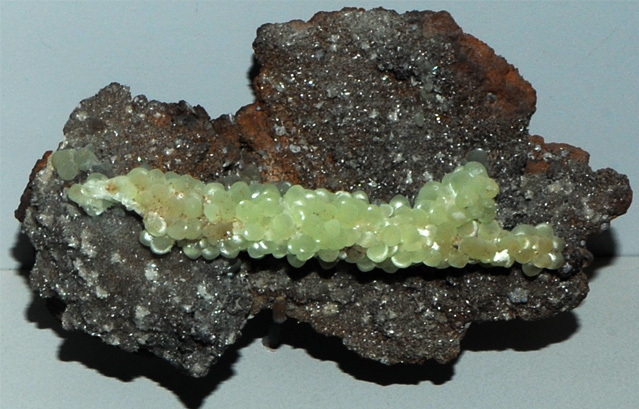 The sample above exhibits a typical structure for Smithsonite, having the appearance of grape clusters. The form is called "botryoidal", and in large samples has the appearance of a bubbly landscape. Smithsonite is a member of the calcite group of carbonates along with rhodochrosite and siderite. The sample of Smithsonite at right is from Mammoth Mine, Tiger, Arizona. It measures about 7cm across with the spherical crystal being about 3 cm in diameter. Smithsonite is named for James Smithson, founder of the Smithsonian Institution. It's most well-known colors are apple green to bluegreen, but can be purple or lavender and a range of other colors from impurities. It has a silky or pearly lustre. 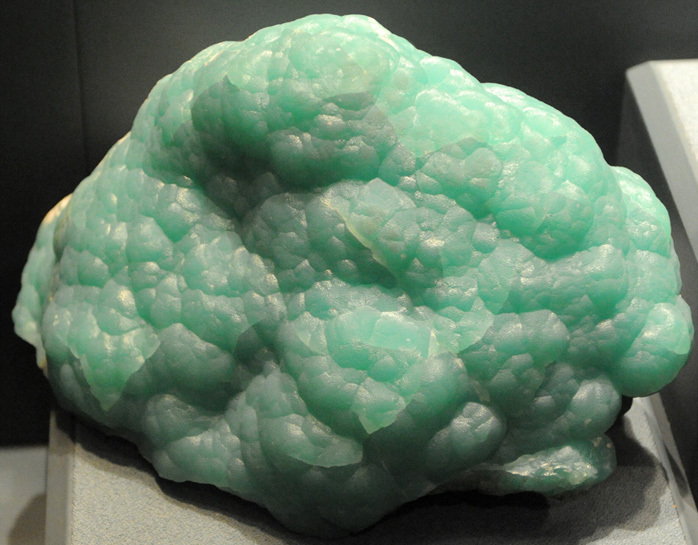 Smithsonite is a minor ore for zinc. Another color variation for smithsonite. This sample measures about 16x16cm. It is from the Kelly mine, Socorro County, New Mexico. This smithsonite specimen is about 19x24 cm and is from Kelly mine, Socorro County, New Mexico. "Millions of small, needlelike crystals form each mound on this specimen. The mineral is named after James Smithson, founder of the Smithsonian Institution. 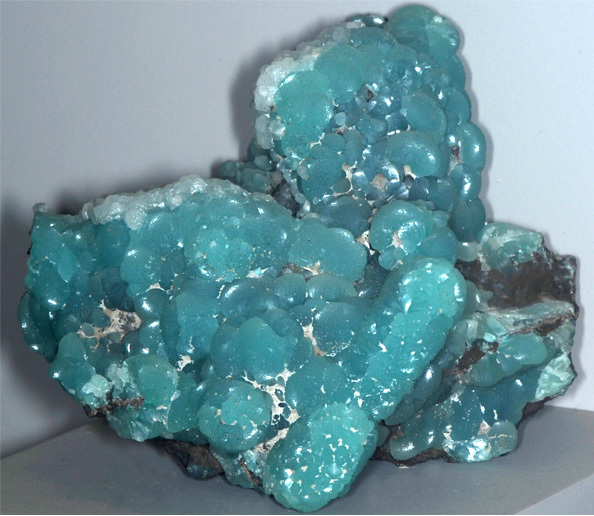 He first recognized smithsonite as a distinct mineral. It is mined for zinc." 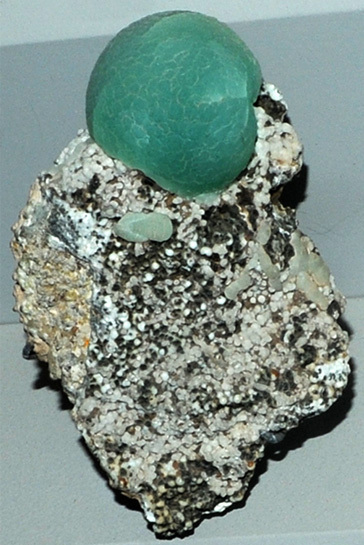 This sample is described as smithsonite with mimetite. The orange color of mimetite appears to have had a dramatic effect. The sample measures about 7x9 cm and is from Tsumeb, Namibia.